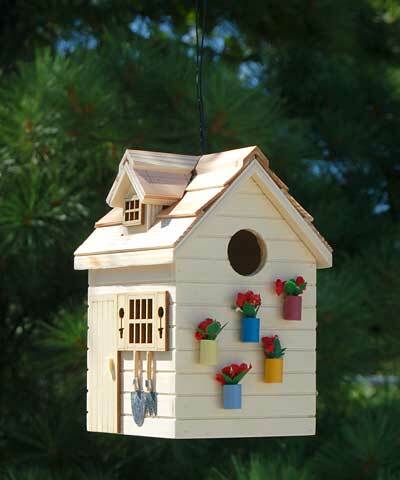 Blend birding and gardening motifs in your yard with this Home Bazaar Natural Potting Shed Bird House. This detailed, charming structure enhances your bird garden in a bold and unique way, thanks to its wonderful colors and hardy construction. The wooden body sports a natural, tan finish, and lines throughout it evoke beadboard siding. A pitched roof with a dormer covers this unit, and a faux window and door on the front add realistic architecture to it. A miniature shovel and tined spade hang beneath the faux window, while fabric flowers in colorful, wooden pots complete the piece. A 1.25" diameter entrance hole sits above these flower pots, for small songbirds to easily access the home. The adorable unit provides room for a nesting wren or chickadee, and its unpainted interior keeps nestlings safe. A ventilation gap beneath one side of the roof, along with the wooden body, help regulate the item's internal temperature, and a hole on the base allows any captured water to drain. The hardy, attached cable enables you to hang this home from a hook or branch in moments, and a generous panel on the back of the piece removes for nest checks. The natural, tan color of the shelter meshes with virtually any setting, and helps the colorful pots capture the eye. Offer small birds a fantastic, floral roost with this Natural Potting Shed Bird House. Note: Climate and the elements will weather this house and change its appearance over time; however, weathering will add to the home's natural charm without compromising its function. Should you want to preserve the natural finish of this item, you should cover it with several layers of a polyurethane product that is recommended for marine use (UV Rated). You should expect that once left outside, the home will weather and require refinishing.